Need to repair corrupt Microsoft® Access database files? When you try and open the file, do you get an Access database error message? Are you unable to open the Access database? Although you can open the Access database file, does it show errors, not work properly or appear to be corrupt? Do you need to get back deleted Access database tables and/or records? Have you lost the password for your Access file? In these instances, we recommend AccessFIX as one of the best programs to repair and recover data from a corrupt Microsoft Access file. The free demo of AccessFIX provides a preview of the repaired file on-screen allowing you to view the contents of Tables, Queries, Forms and Reports interactively. This means that you can see how well your corrupt Access file has been repaired before deciding to purchase. There is no risk! AccessFIX recovers tables, queries, forms, reports, macros, modules, relations, the referential integrity, primary and secondary indexes, field properties, non-western characters, and absolutely all field types including Memo, OLE and high precision numbers (Decimal). 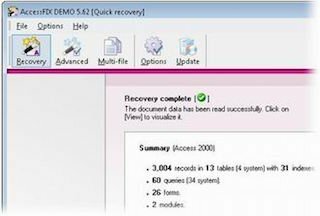 You can perform the recovery in only a few minutes, safely and confidentially on your own computer and there is no need to send your files to an unknown third party for recovery. 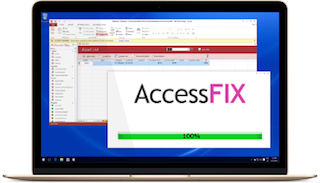 AccessFIX works with Microsoft Access 95, 97, 2000, 2002 (XP), 2003 and 2007. Click Recover and let AccessFIX do its work. In a few seconds it will show you a summary of the repair operation. repaired database within the preview window. you then need to purchase the full version of the software to save the repaired file to disk. We hope you are able to recover and repair your corrupt Access database file.